Recently, an all-new version of Sn0w breeze is released which comes with the capability of jail breaking i OS 4.1 installed on your i Phone or on i Pod touch allowing you to create a custom firmware. All you will be requiring for creating the custom firmware are the latest snow breeze, stock iOS 4.1 and also the latest i Tunes 10.1. Snow breeze is compatible with iPhone 3G/3GS/4G, i Pod Touch 2G/3G/4G, i Pad and also is compatible with Apple TV 2. Please also note that with snow breeze you will be able to preserve the base band and will be able to use the current version of ultra-snow which can be used for unlocking. 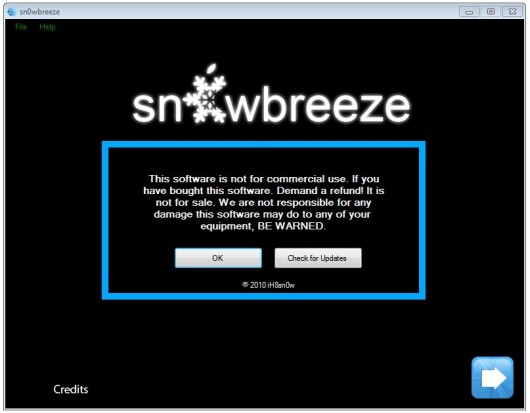 Firstly, you will need to download and start snow breeze from the above mentioned link. Windows Vista / Win7 users will have to run this tool in Administrator mode. For this, just right click on the tool’s icon and select the option ‘Run as administrator”. Now, connect your i OS device with the desktop or Laptop. As soon as you connect your device with the desktop or Laptop, you will see a splash screen which tells you that this software is not for commercial use and now you need to click on OK. After clicking on the OK button, you just need to click on the blue arrow to continue. Now, after clicking on the blue Next tab below, you will see a screen where in you need to select ‘Expert Mode’ and not on Simple mode and then click on the blue tab at the bottom right to proceed. You will now have to choose the stock i OS 4.1 downloaded earlier by clicking on the Browse tab, select the file where you have downloaded and stored in the pc or laptop and then simply click on Open. Now, Snow breeze will show a pop-up window regarding the old/new boot ROM. Read it carefully and then click on click I Understand. Now all you need to do is to just customize the firmware with simple options mentioned below.. Just click on General and then proceed by clicking on the blue arrow at the bottom right. Next on the screen, you can pre-install the packages. You can also add packages from the default repos, or you can even add .deb files which you have saved on the computer. You can’t add new repos at this point of time. Now on the next screen you can change the both Boot as well as the Recovery Logo. You can also use the ones which are there in snow breeze itself or also you can upload your own, or even choose not to change them at all. If you want to upload your own then only PNG image format files are accepted and that too with dimensions below 320 * 480 Pixels and must be limited to 100Kb per boot logo and must have at least one transparent pixel. So, now once you are done, click on the blue arrow at the bottom right to continue and now snow breeze will create the custom firmware. So, now, you’re almost done with the process. If you will be asked if your iOS device is jail broken or not, just choose NO (no matter if you are) and then you need to put the device in the recovery mode or in DFU. You will need to hold the home button and power button until you will see that the i Tunes logo and USB cable on your device’s screen. Until you see that on your screen, the device will turn on and off a couple of times. Keep holding the buttons down, until you see the i Tunes logo back. All you need to do is to just use Rec Boot to put your device in recovery mode. Also most importantly, please note to put the Apple TV in the DFU mode. Now just open the i Tunes and you will find that it will prompt you with a message that it found a device in recovery mode, just click on OK to continue. Lastly, wait for the i Tunes to restore your iOS on the device with the custom firmware and you are done with the complete process. Though this is bit of a time consuming but a very beneficial one. So, now you have successfully learnt on how to Jail break almost all Apple products.